GG came to my pet sitting clients at 7 months old. She's a red merle Aussie with the sweetest face. She was just what we all needed. Just a few months apart, my clients had lost both their male Aussies at 6 and 7 years, way before we expected. I thought they'd be off traveling around the world with their new-found freedom. We held a dog conference. 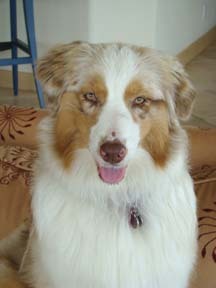 If I was up for it as their dog sitter "the three of us will be getting two Aussies," said Mrs. Client, in about six months. In three months chimed in Mr. Client. That night I got a call that they were picking up GG on Friday! We haven't looked back. She was supposed to have a show and breeding career, but now is a pampered pet in a beautiful home. Oh, yeah. They wanted to change her name from Gigi (Georgie Girl) to GG (Gorgeous Girl). Done!